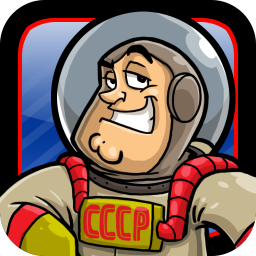 Cosmonauts is an amusing game that’s easy to pick up and play at any time. 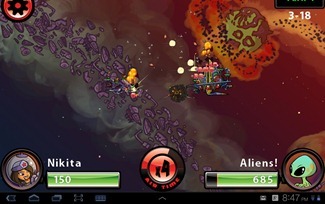 It offers familiar three-stars-per-level gameplay, but also allows for combat against real players. If you want to play with a friend, Cosmonauts offers a pass-and-play option, meaning you and your opponent share a device. Alternately, you can choose to be paired up with a random opponent for online gameplay. Since the game only launched very recently, there isn’t a huge population of players to be paired with, but it’s a nice mechanic that adds a certain something to the game overall. Something I like about this game is its consistency. When you gain rank in Single Player mode, it (along with your arsenal) carry over to multi-player modes. Additionally, Cosmonauts gives you a huge arsenal, from a molotov cocktail slinger, to a gun that shoots bears wearing Russian hats. These weapons add to the overall comic feel of the game, and make things a lot more interesting. 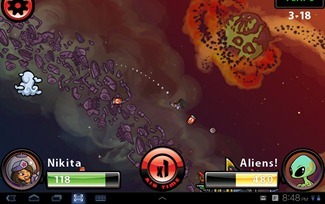 It's also worth noting that Cosmonauts supports in-app purchases of upgraded/themed ships, captains etc. for those wanting to have an aesthetic advantage over their opponents. My one complaint with this app is that it’s bulky and kind of slow. The download is about 28MB, and the game takes a while to start up. Once it’s running, it seems to perform fine, but these initial issues make me think there’s something to be desired in terms of performance and efficiency (as well as memory economy). Cosmonauts' Single Player mode is certainly what makes it a game that's easy to pick up for five or ten minutes at a time, offering relatively quick matches, and three chapters to play through. Besides the chapter/level-based gameplay, Cosmonauts offers a "skirmish" mode, in which you can hone your skills by battling dummy opponents that match your rank and weapon selection. In Story Mode, you'll follow the drama of a galactic superpower (ie Russian cosmonauts) attempting to conquer outerspace by outgunning everyone else (including aliens). You can expect the tried-and-true, three-star level structure here, with stars awarded based on how many turns it takes you to down the enemy ship. 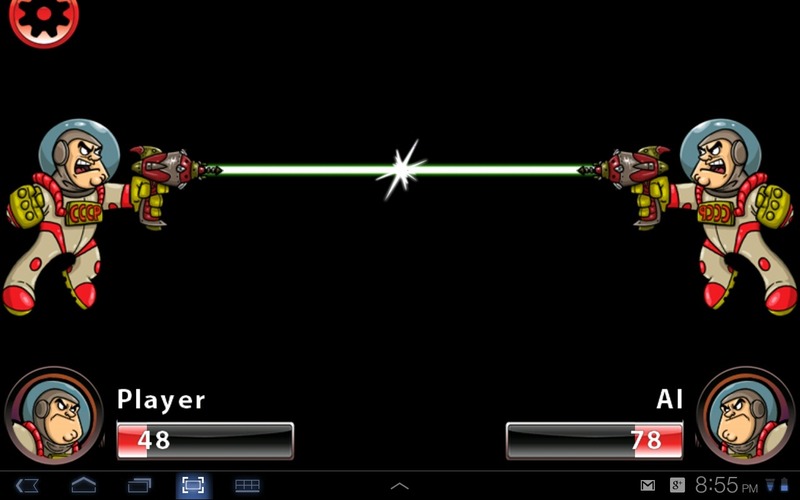 Besides this, the player can gain rank, which brings with it new guns and more strength. In my mind, the story behind "Story Mode" is vague and unimportant. What the player will really notice is the gameplay, which is surprisingly slow-paced, giving you ample opportunity to line up your shots against the opponent. Despite a lack of fast-paced action, the game stays fun. I think this has a lot to do with the huge variety of weapons, locations, and enemies, as well as the amusing tidbits of story-related banter between levels. Skirmish mode tones down the action even more, acting as a sort of training ground. While the overall feel of the gameplay in Skirmish mode is a bit more relaxed, this is where Cosmonauts really starts to shine. 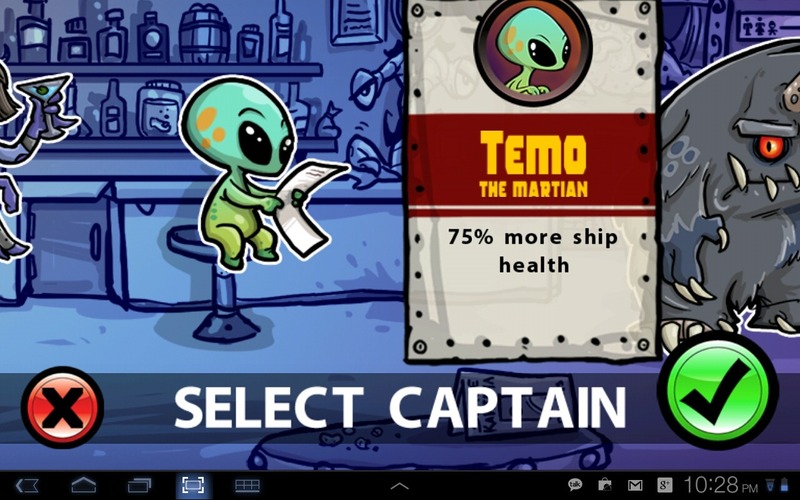 The game includes a ton of options for customizing your battle, allowing the player to choose their ship, weapons, and even which character is their captain. In Skirmish mode, you'll automatically be pitted against a clone of yourself, played by the computer. The AI here actually challenged me, and I was only able to beat it a few times, which made for a fun challenge. The battles are, of course, turn-based. After each turn, however, the ships move closer and closer. 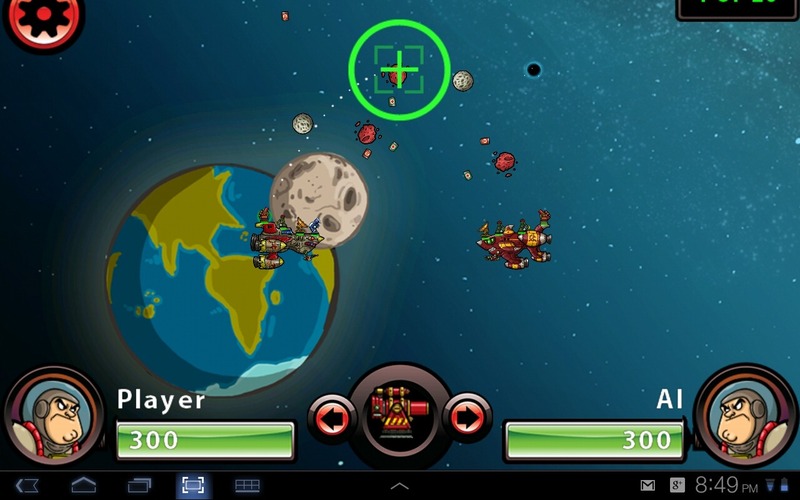 If neither player is defeated before the ships get too close, the player with the higher score wins in a cartoony laser-gun battle. I thought this was an elegant way of avoiding a never-ending battle. Cosmonauts also has some interesting multiplayer options, allowing for competition that's a little more realistic. Like I said earlier, the game just recently launched, so finding an opponent takes a while, and I had even more trouble finding an opponent who would respond after the first move, but it is entirely possible that this is a software kink that still needs to get worked out. 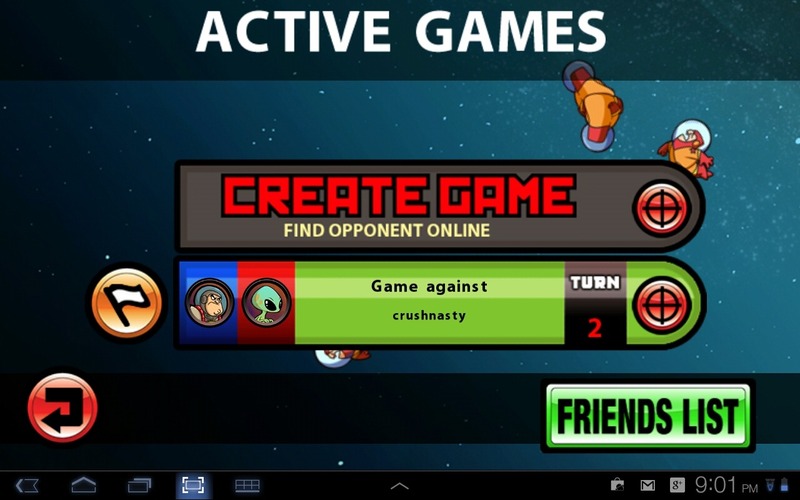 Besides playing online with random opponents, one can also utilize the Pass-To-Play mode, which pits two people against each other on the same device, requiring you to pass the device to your opponent. Before I go too far, let's look at each of the modes individually. 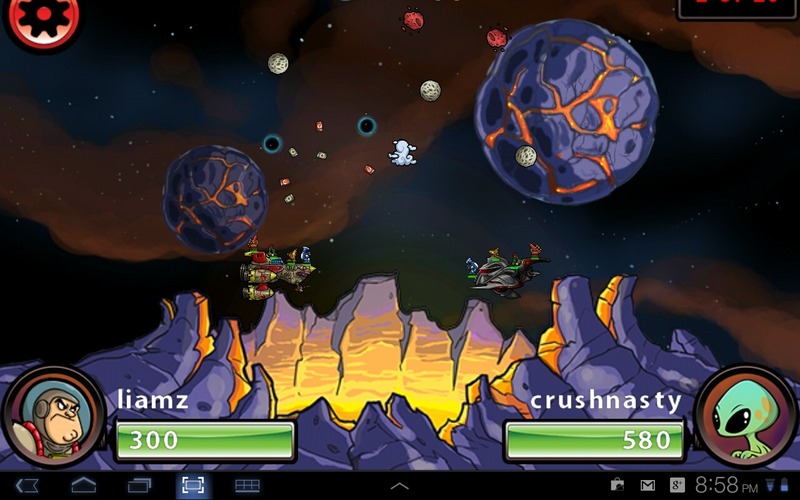 The online multiplayer mode seems promising, and will certainly be fun as soon as there are more users. 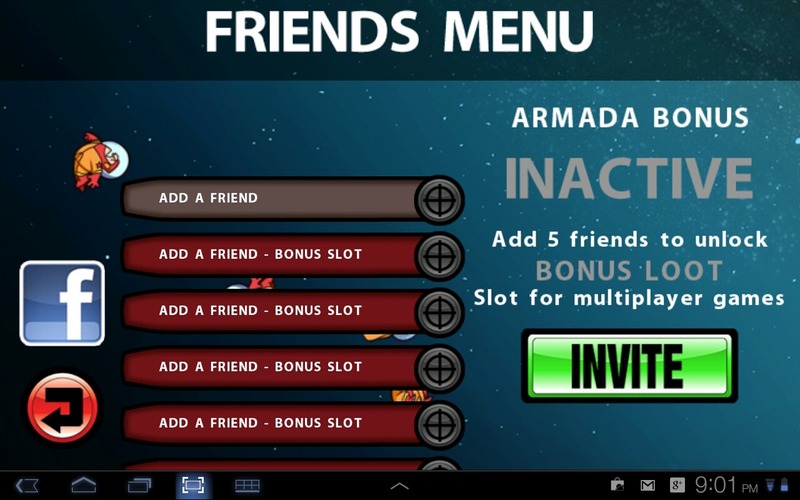 Accumulating a long list of "friends" (read: bitter opponents), will gain the player special bonuses and items for their future battles. This is an interesting concept, as it adds more of a social feel to the game (besides its Facebook integration), which makes Cosmonauts seem a lot more well-rounded and polished. The actual battles are a great challenge, pitting you against enemies who could be much more powerful than you, and really forcing you to try out all the weapons, as cutesy as some of them may be. Here, too, the player can choose which ship, captain, weapons, and even equip-able items to take into battle. This mode of play looks just like the Skirmish mode discussed earlier, except it lacks an AI opponent. What I mean by this, is that both players must necessarily be the same as far as weapons, ships, etc. since they share one device for the game. This isn't necessarily a problem, since the game has enough variables to be challenging regardless. I rather like that this mode was included, because it enables one-on-one battles on-demand, though you may run the risk of your opponent chucking your phone across the room. Cosmonauts is a great game. It is a fun time-killer that's easy to pick up and put down. By design, the matches are never too long, and the ability to play online with random opponents (and save them as friends for rematches later) is brilliant and adds so much more to the experience. Best of all, the only cost to you is any in-app purchases you choose to pick up - the game itself is completely free in the Android Market. With all the things it has going for it, I can overlook Cosmonaut's hefty size and fully recommend it.